Citation: Kumar D, Shriwastav R, Sabnis G, More D, Shah H, et al. (2018) Catastrophic Sudden Cardiac Death. Are there Lessons to be Learnt? Eur Exp Biol Vol. 8 No. 2:10. Copyright: © 2018 Kumar D, et al. This is an open-access article distributed under the terms of the Creative Commons Attribution License, which permits unrestricted use, distribution, and reproduction in any medium, provided the original author and source are credited. Sudden cardiac death describes an unexpected natural death from a cardiac cause within a short time period, generally ≤ 1 hour from the onset of symptoms, in a person without any prior condition that would appear fatal . Although labelled so it is not always that it happens without warning signs and symptoms. We describe a case which exemplifies how such catastrophe if not identified in time, can occur with refractory symptoms. Most of the times a simple history, clinical examination and a 12 lead ECG is enough to establish a diagnosis . It is also important to be clinically aware of cardiomyopathies. If a timely diagnosis is made, then appropriate management can be instituted, and catastrophe can be prevented. A 33-year-old farmer while working in his field had a syncope and was brought to the Emergency Room (ER). On examination patient had tachycardia and was in cardiogenic shock with a blood pressure of 70/56 mm of Hg (Figure 1A). His ECG showed broad complex tachycardia with superior axis and LBBB morphology (Figure 1B). Figure 1: A- Sinus rhythm ECG showing T wave inversions in V1-3. B- LBBB superior axis VT. C & D- Fibro fatty infiltration of RV (red arrow). E- microscopic H & E section showing epicardial fatty infiltration (black arrow) and inflammatory infiltrates (red arrow). After 200 Joules of synchronized biphasic direct current (DC) shock was given, the patient reverted to sinus rhythm. This ECG showed only T wave inversions in leads V 1-5 (Figure 1A). After stabilization amiodarone infusion was started. However, unfortunately the patient had a recurrence of ventricular tachycardia which degenerated into ventricular fibrillation. There was no response to DC shock and about 45 minutes of cardiopulmonary resuscitation and the patient succumbed. An autopsy was performed. 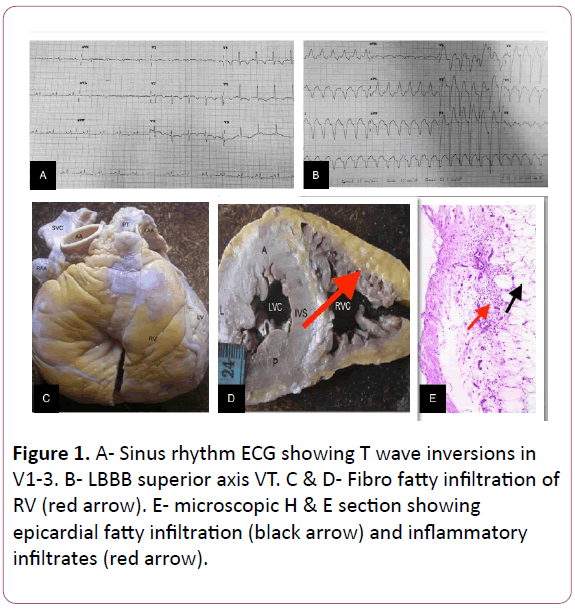 On gross examination, the right side of the heart showed yellowish infiltration suggesting fatty or fibro-fatty replacement starting from epicardium extending into the endocardium with thinned out myocardium (Figures 1C and 1D). Almost entire muscle layer of right ventricle was replaced by fatty or fibro fatty tissue. This is the hallmark feature of Arrhythmogenic Right Ventricular Cardiomyopathy/Dysplasia (ARVC/D). Definite diagnosis of ARVC requires the histopathologic finding of transmural fatty or fibro-fatty replacement of RV myocardium (Figure 1E). There are two histopathologic variants, namely fatty and fibro-fatty ARVC/D. In the fatty (or lipomatous) variant, the adipose tissue reaches the endocardium (transmural infiltration) and the wall thickness may be normal or even increased (“pseudo-hypertrophy”). However, a small amount of fibrous tissue, usually focal, is always present. In the fibro-fatty variant, the wall is thinner, parchment-like and translucent which accounts for the saccular aneurysms in the so-called triangle of dysplasia, a feature that should be considered pathognomonic of the disease . ARVC is an inherited cardiomyopathy characterized by structural and functional abnormalities of the right ventricular myocardium with a frequency of approximately 1: 5,000. It is an autosomal dominant trait with variable penetrance and incomplete expression. It is an important cause of sudden cardiac death in young adults accounting for about 11% of all deaths . Although ARVC requires histopathologic examination for definitive diagnosis, the typical ECG features and imaging help to identify patients earlier and prevent sudden cardiac deaths . a) Concealed form, minor arrhythmias, which usually go unnoticeable. The diagnosis is usually made during family screening. b) Overt Electrical Heart disorder, the most typical presentation, which usually occurs in young patients presenting with severe and symptomatic ventricular arrhythmias and SCD. c) RV failure, RV dysfunction with pump failure. d) Biventricular failure characterized by progressing dilation of RV and LV; this usually develops late in the natural history of the c.
c) Epsilon wave (electric potentials after the end of the QRS complex). It is a major diagnostic criterion found in up to 30% of cases of ARVD. Other ECG markers of ARVD have been reported: QRS and QT dispersion, parietal block defined as a QRS duration in leads V1 through V3 that exceeds the QRS duration in lead V6 by >25 ms, a prolonged S-wave upstroke in V1 through V3=55 ms (it was seen as the most prevalent ECG feature in 95% of ARVD . Those patients meeting the fixed diagnostic criteria by Marcus et al. can be used to make a definitive diagnosis and appropriate management can be instituted . Ackerman M, Atkins D, Triedman J (2016) Sudden Cardiac Death in the Young. Circulation 133: 1106-1026. McGregor SM, Aliya N, Husain A (2015) Brief Review and Update of the Clinico-pathologic Diagnosis of Arrhythmogenic Cardiomyopathy. Arch Pathol Lab 139: 1181-1189. Corrado D, Link M, Calkins H (2017) Arrhythmogenic Right Ventricular Cardiomyopathy; Review article. N Engl J Med 376: 61-72. Thiene G, Nava A, Corrado D (1988) Right ventricular cardiomyopathy and sudden death in young people. N Engl J Med 188: 129-133. Corrado D, Basso C, Thiene G, McKenna WJ, Davies MJ, et al. (1997) Spectrum of clinico-pathologic manifestations of arrhythmogenic right ventricular cardiomyopathy/dysplasia: a multicentre study. J Am Coll Cardiol.1997. 30;1512-1520. Philips B, Cheng A (2016) Diagnosis and management of arrhythmogenic right ventricular dysplasia. Curr Opin Cardiol 31: 46-56. Marcus FI, McKenna WJ, Sherrill D, Basso C, Bauce B, et al. (2010) Diagnosis of arrhythmogenic right ventricular cardiomyopathy/dysplasia: pro- posed modification of the Task Force Criteria. Eur Heart J 31: 806-814.